Panko Pesto Mozzarella Balls for the win! 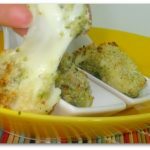 This cheesy baked appetizer is crazy addictive and totally tasty too! Cube and freeze your mozzarella 12-24 hours ahead of time. To freeze, lay cubes flat on a plate for 15-20 minutes and then move to a plastic baggie or covered bowl to freeze even further. This prevents sticking and also is a fabulous method for freezing fruit and veggies! Keep mozzarella cubes frozen until you have set up your ingredients into dipping bowls and preheated the oven. Combine seasoning blend and panko in a shallow bowl. Keep egg whites, flour, and pesto in separate bowls for dipping. Move quickly so your balls don't begin to defrost, lol! After each ball gets it's turn in each bowl, place your completed mozzarella balls on your wire rack (the one you put on top of a aluminum foil lined cookie pan) after spraying/greasing the rack with olive oil. Once all your balls are in place (this is technical terminology people!) spray them with a light coat of your cooking spray and bake for 8-12 minutes, or until golden brown on the outside and soft and stretchy on the inside. Enjoy immediately.